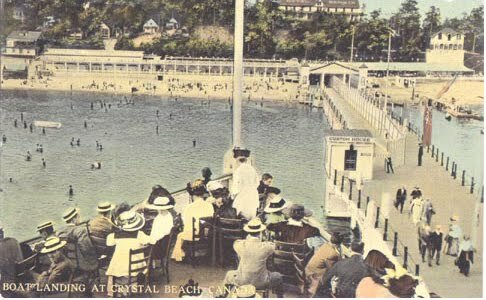 The first pier at Crystal Beach was built around 1890. 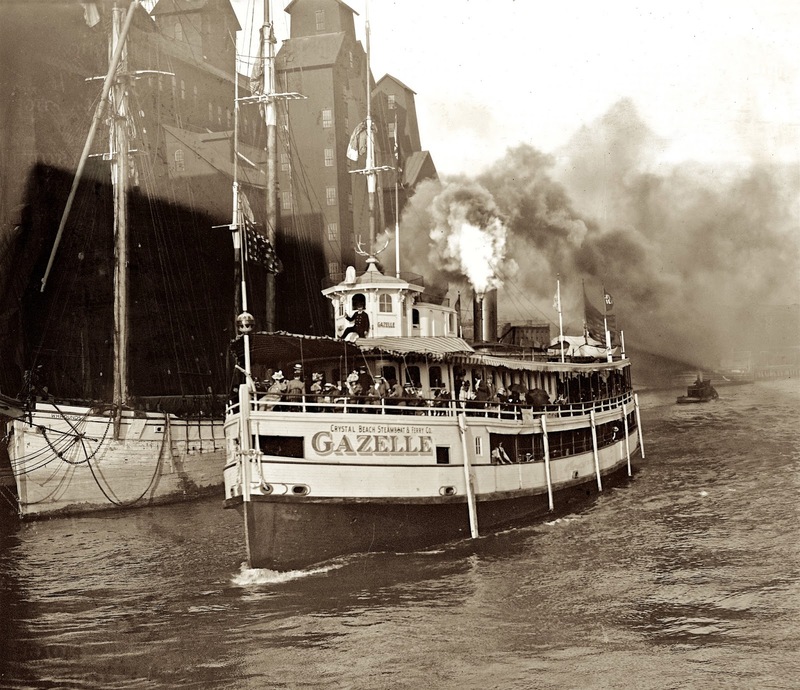 A rush of visitors kept 17 ferry boats busy to the state of New York, beginning with the Dove. 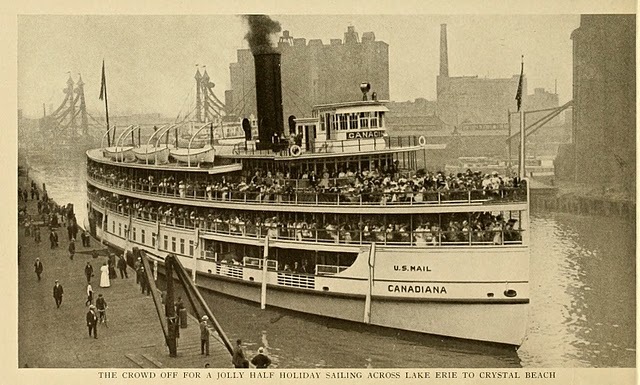 Boats other than the Dove that plowed the turbulent waters between Buffalo and Crystal Beach, included the Superior, Premier, State of New York, Cole, Idlewild, Timon, Pilgrim, Puritan, GAZELLE, Argyle, White Star and The Pearl, Later renamed The Crystal. These boats differed from the Americana and the Canadiana. They did not venture out if the weather was bad. 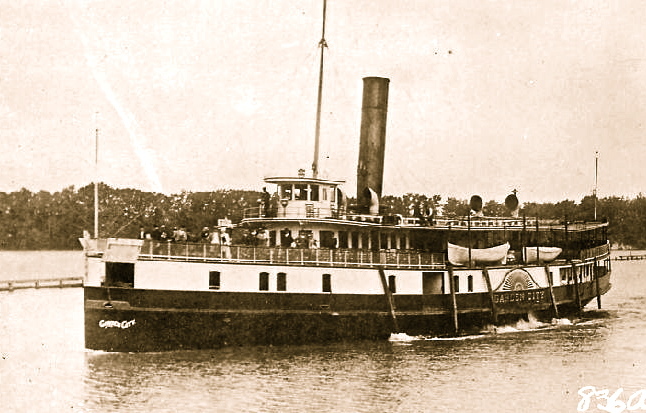 The Idlewild, for example, had her smokestack ripped off by rough seas at Windmill Point. While the Timon, rolled so badly that it was only kept one year. 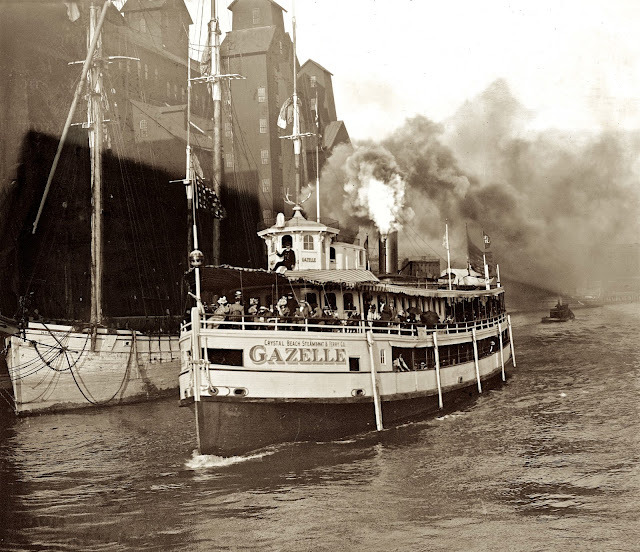 The GAZELLE was worthy of her name being a particularly frisky boat whenever heavy seas rolled over Lake Erie. She was safe and easy to handle so she was kept in service for many years. 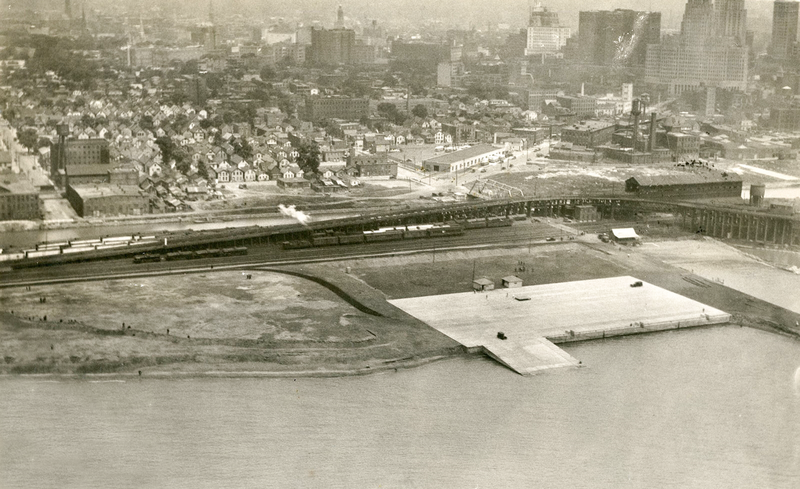 Buffalo's First International Airport - The Outer Harbor! Inaugurating the first international aerial passenger service out of Buffalo, a giant amphibian air liner of the Colonial Western Airways, will take off from Buffalo Harbor this morning to wing its way to Toronto---another link in the city's chain of air lane contacts. At 9:50 o'clock the big twin motored carrier will glide down the ramp from the new terminal at the foot of Georgia St. with a full load of private passengers and newspapermen... The take off will be witnessed by prominent city officials and others. Traveling to Niagara Falls, the big ship will circle the cataract before continuing to Lewiston, from where it will fly across Lake Ontario to Toronto Harbor, the trip taking 45 minutes. In both cities the start of the passenger airline service was an event. 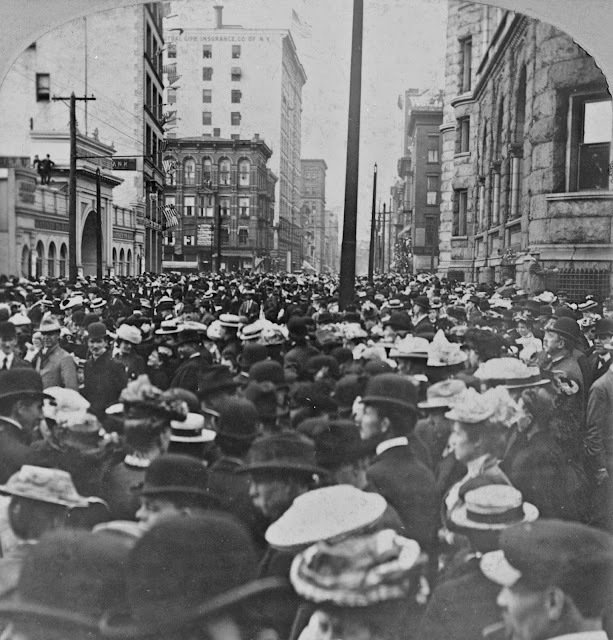 In Buffalo crowds hailed the start of the initial cruise, lining the temporary ramp at the foot of Georgia St. at an early hour and waiting an watching with interest as workers tugged to get the great airfish floated. 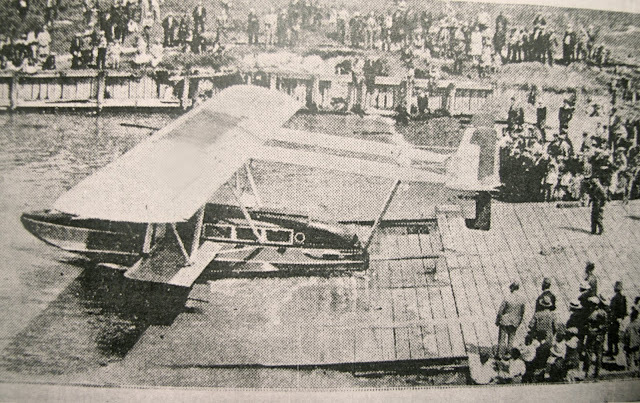 Passengers for the first flight arrived at the Buffalo starting place promptly at 9:30 o'clock, and nearly 500 persons attended the start. Passengers on the maiden trip were: Mr. and Mrs. George N Crouse of Syracuse, veteran air passengers and first-flighters: Cyrus Coffman, John Daniels Jr. of the Hotel Statler; H. Ralph Badger and representatives of the Buffalo press, Stephen B Kane of the Buffalo Times; Charles Mickey of the Buffalo News, and Miss Anne Murray McIlhenney of the Buffalo Courier Express. Piloting the trip was Charles H. Maris, a young flier of the Colonial Western Airways, who has piloted the air mail for quite some time..... The airline inaugurated yesterday will operate daily and holidays on the following schedule: Leave Buffalo 9:50 a.m., arrive Toronto 10:35 a.m.; Leave Buffalo 5 p.m., arrive Toronto 5:45 p.m.: Leave Toronto 11:15 a.m., arrive Buffalo 12 noon; Leave Toronto 6:30 p.m., arrive Buffalo 7:15 p.m. EDITORS NOTE: Wandering around Lasalle Park did you ever notice that concrete ramp going into the water at the south end of the park, between the park and where the high rise condos begin? Most people assumed it to be a boat launch. In reality, it was Buffalo's first International Airport! "Whatever I can do for Buffalo, is at Buffalo's disposal, and I shall be glad to do all I can toward making your Exposition a success." Washington D.C.,. Feb.1 ---- This in substance was the prompt and cheerful response of the President of the United States, the one man in all this great country who can do most to help the Pan American Exposition, as he replied to the explanatory addresses of the members of the committee who called on him yesterday afternoon. 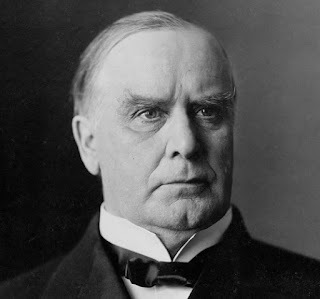 And it was evident from his tone and manner that President McKinley meant every word he said, and that in him the exposition will have a warm friend and a valuable helper. Editor: As we all know (or should) the Pan American Exposition turned out not to be such a warm friend to the President. On September 6, 1901 the president was shot while shaking hands during a public reception at the Temple of Music and died on Sept.14. 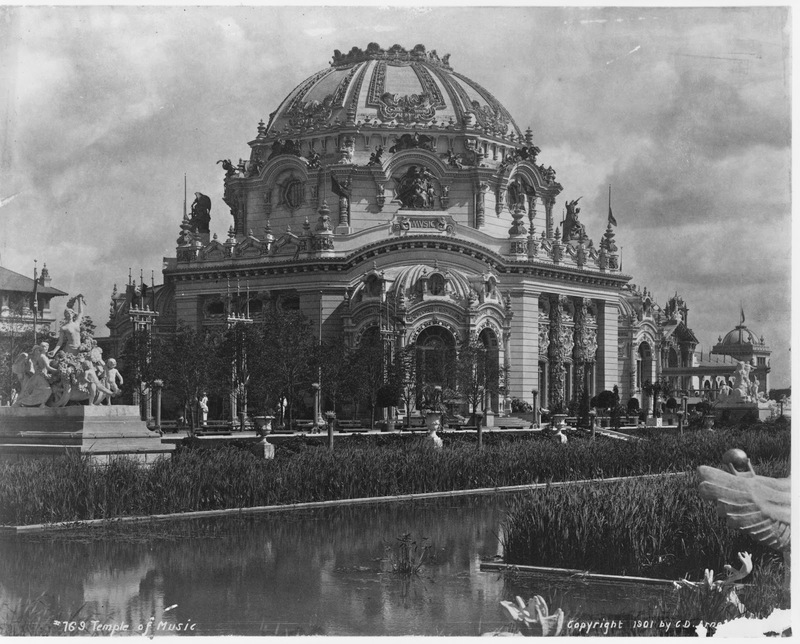 The Pan-American Exposition, staged in Buffalo, New York, presented in microcosm all of the trends, developments, innovations, and attitudes of the McKinley years. The great and colorful buildings along the Grand Canal, built in ersatz Spanish colonial style, symbolized American suzerainty over the hemisphere. The amazing Electric Tower announced to the world the nation's technical superiority. In memory of the late frontier, there was a wild west show. The now-aged Apache chief Geronimo was a part of the show -- accompanied by a U.S.Army guard. The Indian Wars, now just a memory, were turned into spectacle and mock Indian vs. cavalry skirmishes were staged three times daily for exposition visitors. 1901, just hours before he was shot at the Temple of Music. 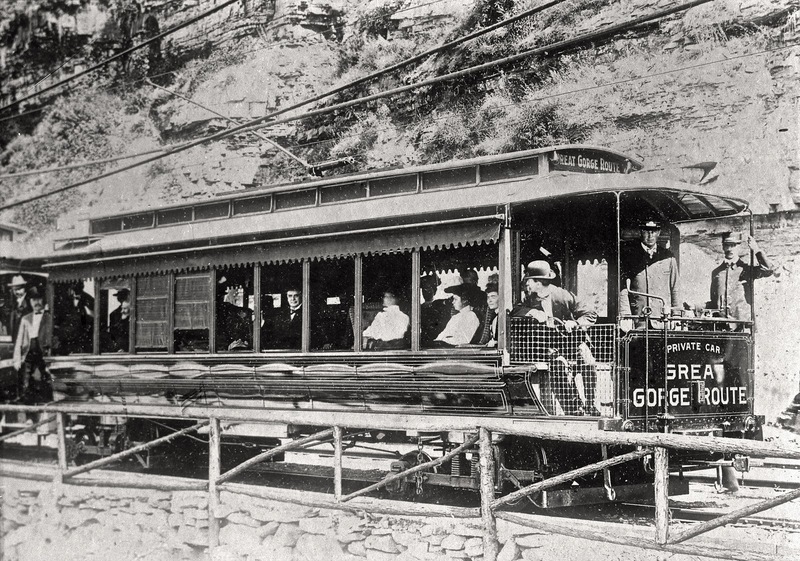 The exposition was opened in the spring of 1901 by the new vice president, Theodore Roosevelt. 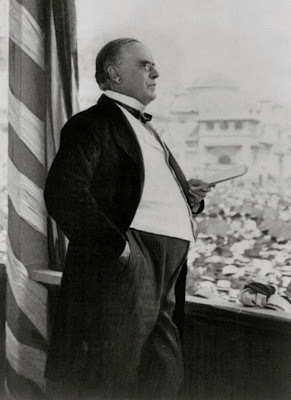 President McKinley had been scheduled to do the honors but had to cancel because of his wife's illness. 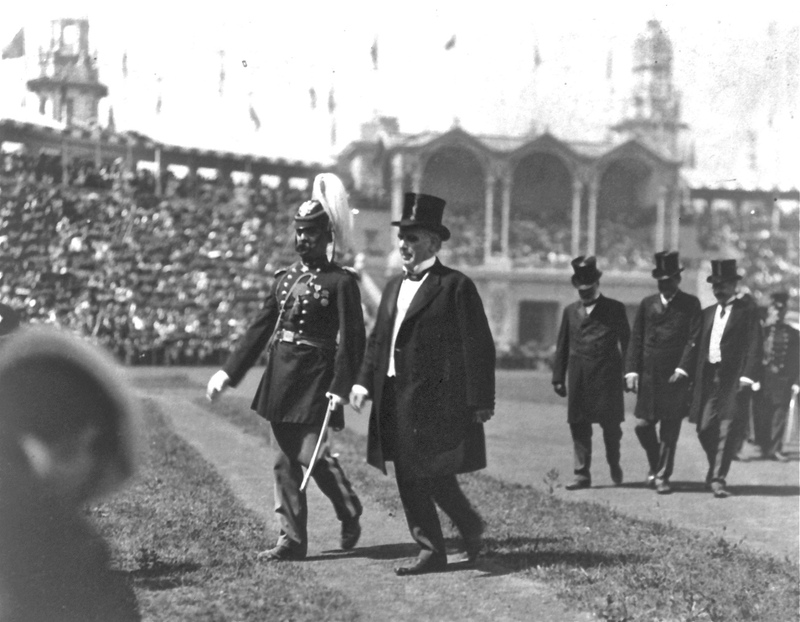 It was not until September that the McKinleys were able to inspect the exposition grounds. 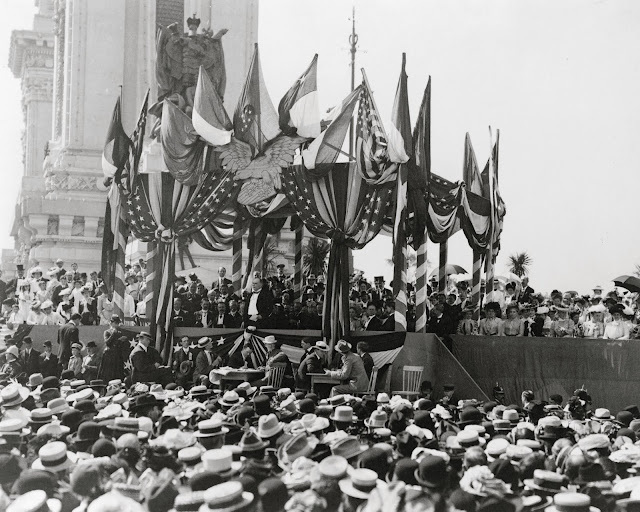 On the morning of September 5th, the president and first lady crossed the Triumphal Causeway and entered the fair grounds in an open carriage preceded by troops, military bands, and a mounted honor guard. The president gave a major address on trade policy to a large crowd gathered on the Esplanade. Afterwards he toured the exhibits, complimenting all. He had an unscheduled coffee at the Puerto Rican Building with the Latin American commissioners. 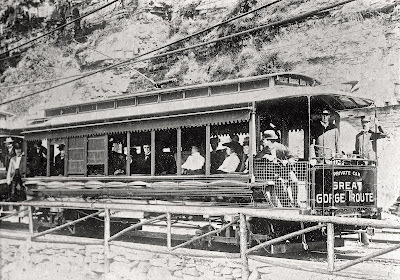 The following day, the presidential party took an excursion by rail to see Niagara Falls. Upon returning to Buffalo, McKinley returned to the exposition grounds for a reception in the Music Building. The president had been standing in a receiving line greeting the public for seven minutes when an anarchist named Leon Czolgosz shot McKinley twice at point blank range. Despite early hopes that he might survive the attack, the president died on September 14th, whispering the words of his favorite hymn, "Nearer my God to Thee, Nearer to Thee." The vigorous forty-two year-old Progressive, Theodore Roosevelt, was now in the White House. The nineteenth century was over and the modern era had begun. Old Guard party boss Mark Hanna complained to a colleague, "Now look! That damned cowboy is president of the United States!" In 1901, the corner of Elmwood and Amherst was the main gate of the Pan-American Exposition. Amherst St. was the MIDWAY between Elmwood and Delaware. Photo is looking S.East across Elmwood Ave. Large building on the right was the Horticulture Building. Domed building just left of center is the Temple of Music where McKinley was shot. To regulate visitor traffic, a wooden fence a mile long and a half-mile wide was erected around the entire Exposition grounds and acreage in the Park. Lower photo, trolley station on Amherst St.
"My fellow citizens, trade statistics indicate that this country is in a state of unexampled prosperity. The figures show that we are furnishing profitable employment to the millions of working men throughout the United States. Our capacity to produce has developed so enormously, and our products have so multiplied, that the problem of more markets requires our urgent and immediate attention. By sensible trade arrangements, which will not interrupt our home production, we shall extend the outlets for our ever increasing surplus. What we produce beyond our domestic consumption must have vent abroad. The expansion of our trade and commerce is the pressing problem. Next in advantage to having the thing to sell is to have the conveyance to carry it to the buyer. We must encourage our merchant marine. We must have more ships. They must be under the American flag: built, manned, and owned by Americans. These will not only be profitable in a commercial sense, they will also be messengers of peace wherever they go. Reciprocity treaties are in harmony with the spirit of the times. We must build the isthmian canal which will unite the two oceans and give a straight line of communications with the western coasts of Central and South America, and Mexico. The construction of a pacific cable cannot be longer postponed. In the furtherance of these objects of national interest and concern, you are performing and important part. The good work will go on - it cannot be stopped." This creation of art and beauty and industry will perish from sight. But who can tell the new thoughts that have been awakened, the ambition fired, and the high achievement that will be wrought through this exposition. Gentleman, let us ever remember that our interest is in concord, not conflict. And that our real eminence rests in the victories of peace, not those of war. We hope that all who are represented here may be moved to higher and nobler efforts for their own and the world’s good, and that out of this city may come not only greater commerce and trade for us all, but, more essential than these, relations of mutual respect, confidence and friendship which will deepen and endure. Our earnest prayer is that God will graciously vouchsafe prosperity, happiness and peace to all our neighbors, and like blessings to all the peoples and powers of earth." and again in 1893; elected President in 1896, and again in 1900. 700 miles of trackage within the city limits. London, or another city in the world. 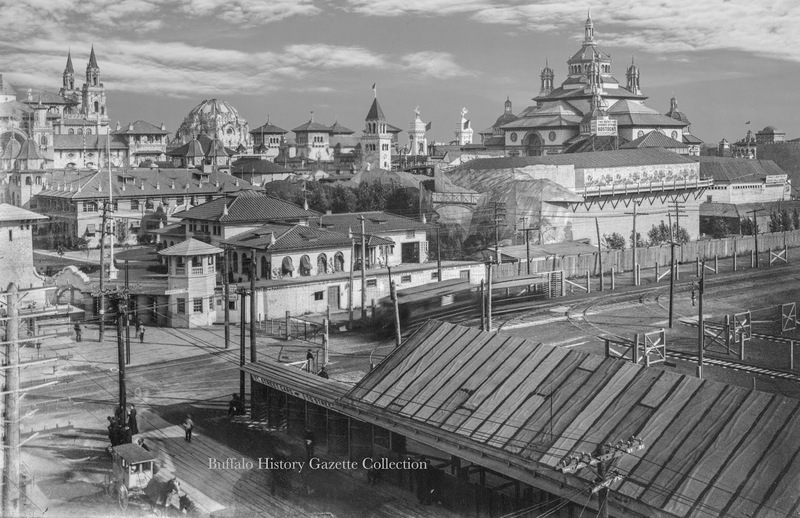 It is hard to imagine now what a metropolis Buffalo was at the turn of that century. Buffalo in about 75 years from the time it was just a small village in 1825, grew to a population of nearly 400,000 and was the fourth largest port in the world! By 1899 there were 52 grain elevators including 4 floaters. 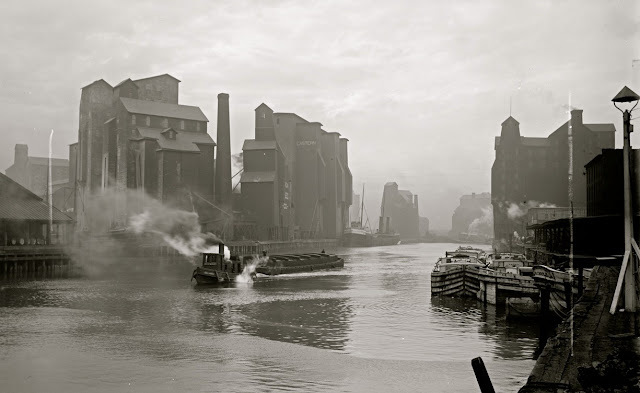 But Buffalo was more than just grain and flour milling, it was the most diversified industrial city in America outside of New York City with over 3500 factories! 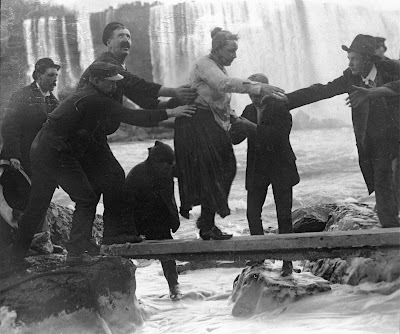 Everyone is familiar the many daredevils who sought glory making attempts to go over Niagara Falls in barrels, as Anne Taylor did in 1901, or walk a high wire across the gorge as Blondin and others did with great success in the 19th century. Now Nik Wallenda made a brave attempt, crossing the Falls on a rope to Canada on June 15(2012). A little known fact is, that Buffalo, not to be outdone by our Niagara neighbors, had it's own daredevils going over the largest things we had to offer, Grain Elevators! Unfortunately, many of the daredevils braving Buffalo's waterfront, learned too late; going over Niagara Falls would have been a lot safer than a grain elevator. 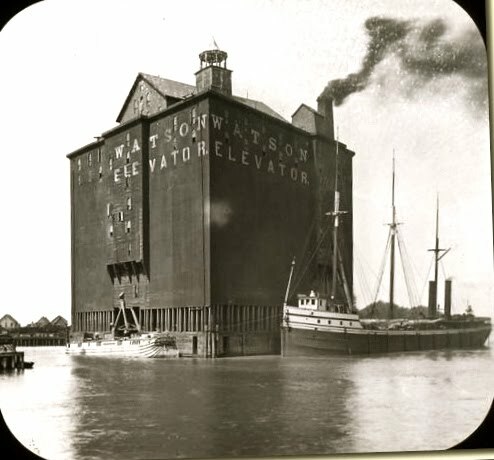 The Watson Elevator was for many years the highest among the large grain storehouses on the Buffalo waterfront. It was a unique elevator situated on an island the same size as the structure itself giving the illusion of the elevator floating on the water. 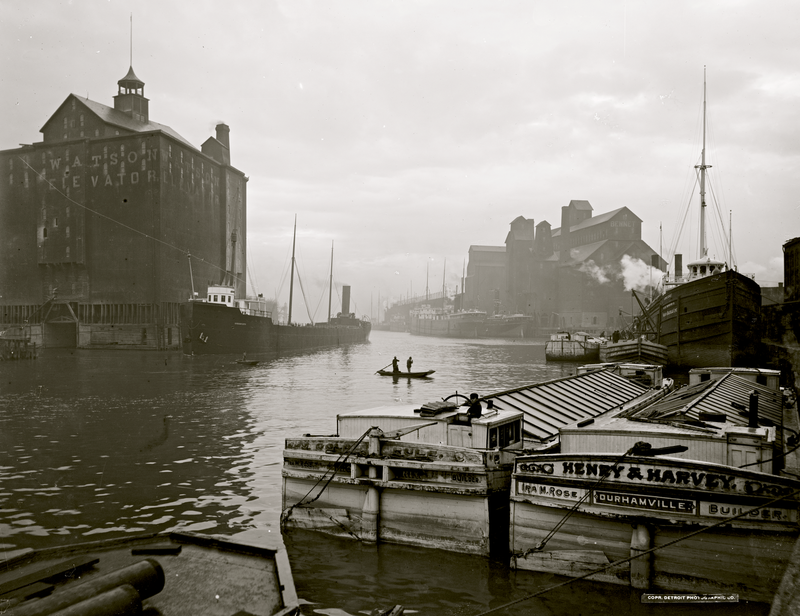 It was located at the junction of the City Ship Canal and the Buffalo River, just opposite Commercial Slip. The marine leg tower, about 110 ft. high was the point from which daring men, ambitious to win notoriety, essayed to leap or dive into the Buffalo River. In 1879 or 1880 Charles Comstock made the first attempt to jump from the Watson Elevator. He advertised the event, and on the afternoon designated, thousands of people lined the old Central Wharf and docks to witness the jump. Comstock fastened a plank extending out about 10 ft., and from it he jumped off! His shoes were weighted with lead, and he descended in an almost vertical line until within about 15 ft. of the water when his body swerved slightly to one side. Hitting the water on left side, he survived suffering only severe bruises and soreness. A few weeks later, a young man named Dingman attempted the bolder feat of diving from the top of the Watson Elevator into the creek. He made the dive but the momentum which his body gathered on the way down carried him head first to the bottom of the river, where he stuck in the mud and broke his neck. About 1897, Akron Jack, a diver of world wide reputation attempted to dive from the Watson Elevator. Jack, unfortunately lost control of the dive and hit the water on his side. Thousands had gathered to witness this daring act and saw Akron Jack meet his death. Two years later another well known diver named Chicago Red attempted to jump from the roof of the elevator into the river. A well advertised event, several thousand people were on hand to witness the performance. Chicago Red jumped all right and landed in the river vertically, but the great speed he gathered took him to the bottom of the river where he stuck solidly in the mud. His body was found a few days later. The Watson Elevator sat on it's own Island Just off Commercial Slip. Just to introduce myself, my name is Jerry M. Malloy and I have always been interested and fascinated by historical events, people and technologies, especially those connected to the Western NY area. For over two decades I have been bringing Buffalo's waterfront history to thousands of people through walking and boat tours, along with photographic lectures and displays at my parents famous historic restaurant, The Harbor Inn on Ohio & Chicago St.
Buffalo is so rich in stories, some well known but most hidden and forgotten except to the most ardent of researchers. As editor and reporter of the Buffalo History Gazette, I will dig up the stories and events as they happened. The stories will vary from the significant news of the day, to snippets of every day life in and around the Buffalo area. Even want ads, job postings of the day may find their way in. Many inventions we take for granted and use every day got their birth right here in Buffalo.